Stellar lumens (XLM) is continuing to make steady progress this month, despite starting off the year in a steep bearish downtrend and unravelling down to new one-year low at $0.07. Today, the asset has managed to hang on in the green with a marginal 1.75% gain against the US dollar and 1.22% against BTC. Trading volume over the last 24hrs has also seen a slight increase of $60 Million as XLM recovers from the intraweek pullback. Coinbase has been a significant driver behind XLM’s recovery over the last 4 weeks, adding support for XLM on the Coinbase Pro platform on March 13, and helping to encourage new bullish momentum with a ‘Coinbase Earn’ 1 Billion XLM token giveaway. 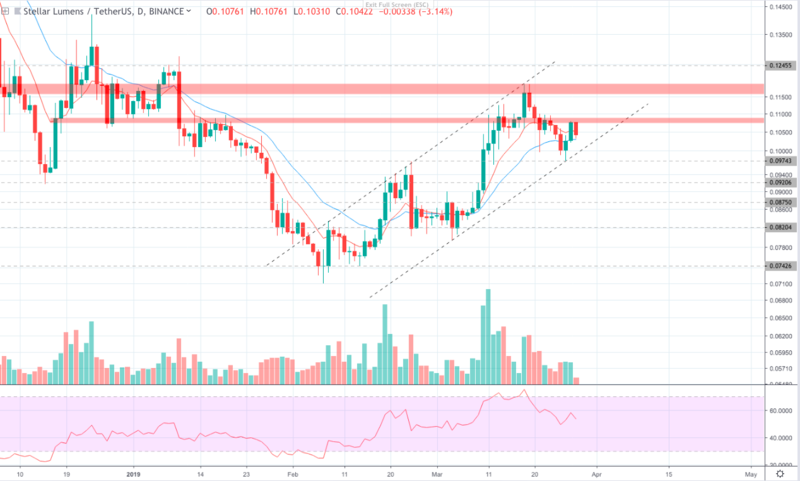 On the 1D XLM/USD we can see that the asset has been climbing inside an ascending channel since finding the bottom on February 6. So far the uptrending resistance has prevented XLM from breaking out over the psychological $0.12, and has forced the price action back under the key $0.1076 resistance (first red shaded area). The long wick beneath today’s candle body however, shows that buying momentum is starting to pick back up again after this morning’s bearish episode, which could be hinting at a potential breakout soon if volume continues to rise. On the 4H indicators, the Chaikin Money Flow, Parabolic SAR and MACD indicators all seem to be favouring a bullish continuation, however the 5/11 EMA lines have yet to show a clear convergence/ divergence to give us further confirmation. 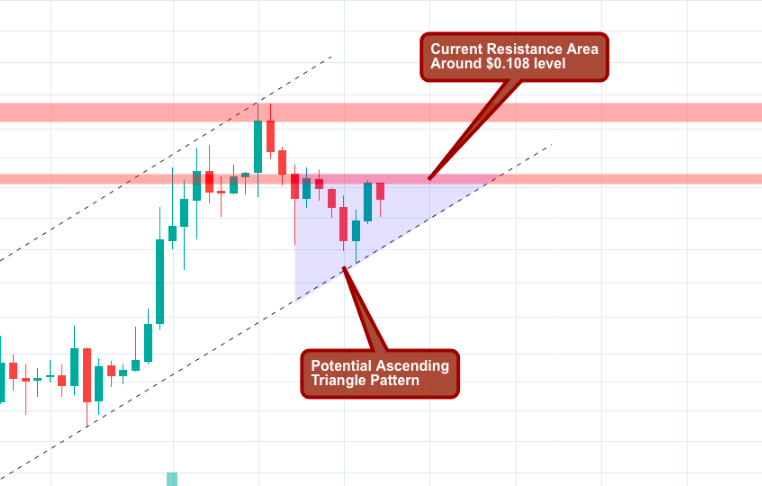 What we could see happen over the next 48hrs, as XLM heads towards the weekend, is the price action fall into an ascending triangle pattern between the $0.108 resistance and the strong uptrending support (see below). 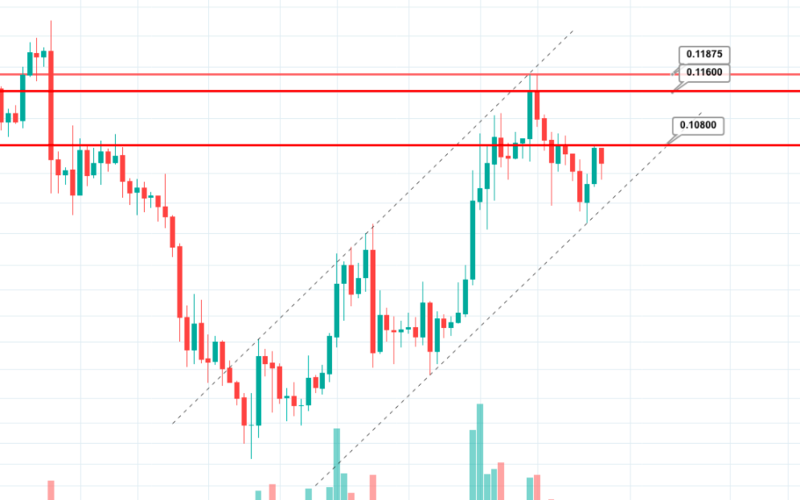 From this we would expect to see bullish momentum gradually outpace the selling pressure at the resistance, before finally breaking over it and going on to retest the psychological $0.12 level above. All ROIs are calculated from the asset’s current value at $0.105 (AToW).